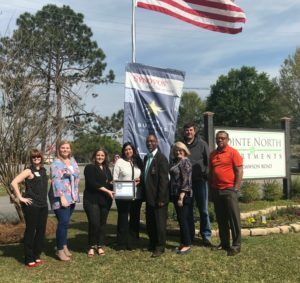 Congratulations to the Albany Area Chamber of Commerce Star Business of the Week, Pointe North Apartments. Pointe North is a quiet oasis in the middle of Albany offering lush landscaping and convenience. Pointe North enhances residents experience through listening and responding to their needs. The personal experience each resident receives at Pointe North sets the benchmark for Albany apartment living. This entry was posted in Star Business of the Week on March 25, 2019 by Mary Bickerstaff.